Total Living: 3,301 sq. ft.
An angled courtyard garage leads your eye to a central gable and arched entry door. The arch motif is repeated on the window transoms and in the dormer windows. 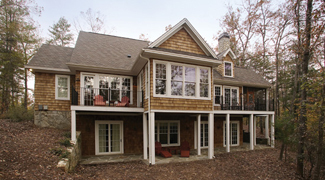 Simple cedar shake adds a woodsy, cottage feel to the Craftsman exterior. Designed for hillsides, this walkout basement plan embraces outdoor living. Twin decks and a screen porch on the main level plus a covered patio on the basement level offer plenty of places to enjoy Mother Nature. 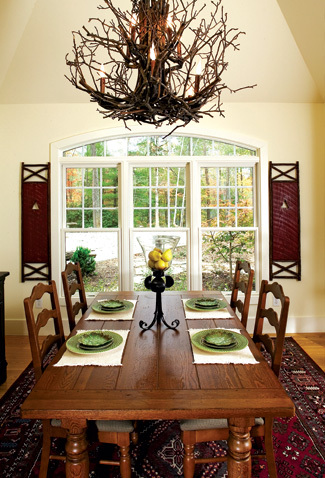 The dining room faces the front of the house and features an arch-topped triple window and a vaulted ceiling. Twin columns add definition without enclosing the space.